THURSDAY, Dec. 11, 2008 (Health.com) — Some people have all the luck. A new study shows that certain individuals with a gene mutation can slurp down milk shakes or other high-fat food and drink without a nasty jump in cholesterol. It’s almost like being born with a built-in cholesterol-lowering drug. The gene is called APOC3, and researchers found that 5% of the people they studied—who were all Amish, in this case—had the protective mutation, according to the report in Science. They do know that it seems to work by speeding up the breakdown of triglycerides, a type of fat. 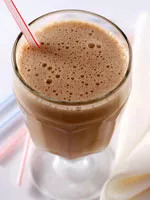 In the study, Toni Pollin PhD, an assistant professor of medicine at the University of Maryland School of Medicine, in Baltimore, and colleagues gave 809 members of the Old Order Amish community in Lancaster County, Penn., a super-high-fat milk shake (78% of calories from fat), and then tracked them for the next six hours. They monitored how volunteers' arteries coped with the fatty drink and checked for calcium deposits in their coronary arteries, a sign of heart disease. The researchers tested the participants’ DNA and found that those who coped with the fatty drink better than others had an APOC3 mutation. The mutation carriers had less artery calcification, indicating that they had healthier hearts as well as higher HDL (good cholesterol), and lower triglycerides and LDL (bad cholesterol). If you’re not one of the lucky gene carriers, it’s still good news. The gene mutation ends up causing lower-than-normal production of a protein called ApoCIII. You may have heard of some of the other factors that indirectly lower ApoCIII: weight loss, cholesterol-lowering drugs, and fish oil. The discovery that directly lowering ApoCIII via the mutation is not harmful—and indeed, might be beneficial—could help researchers develop new therapies to fight heart disease, says Pollin. Pollin adds that the gene variant is rare in the general population, but the effects of reducing the amount of ApoCIII can be universally beneficial. “Over a lifetime, having less ApoCIII confers a favorable lipid profile, which appears to be cardio-protective,” Pollin says. Karol Watson, MD, PhD, codirector of preventative cardiology at the University of California, Los Angeles, cautions that although some cholesterol-lowering drugs decrease ApoCIII, it is an indirect effect and not the primary reason they protect against cardiovascular disease. She did say that the new study and others like it could have important implications for fighting heart disease in the general population. The study, part of the University of Maryland’s larger Heredity and Phenotype Intervention Study that examined how genes and lifestyle factors influence the risk of developing cardiovascular disease, was funded by the National Heart, Lung, and Blood Institute.